Unfortunately, many RV beds come with cheap mattresses that do not provide adequate support or comfort. Mattress toppers are an easy and affordable way to quickly enhance the quality of any basic mattress so you can rest comfortably during your travels. What is Mattress Topper and What is it used for? A mattress topper is a supplemental layer of cushioning that can be added to a mattress to improve its support. Instead of investing in an entirely new mattress, you can buy one and immediately enhance the comfort of any mattress that does not align with your sleep preferences. Whether it is too firm or too soft, there is one out there that will be able to address its faults and improve your sleep. While it may be tempting to buy the cheapest model you can find, it will not be beneficial in the long run. There are many great quality options that are still affordable that will provide the extra support and comfort you need. Cheaper models usually have shorter life spans and are more likely to lack the important features that prevent the development of bacteria growth and odors. With that in mind, let’s review our top seven mattress toppers. 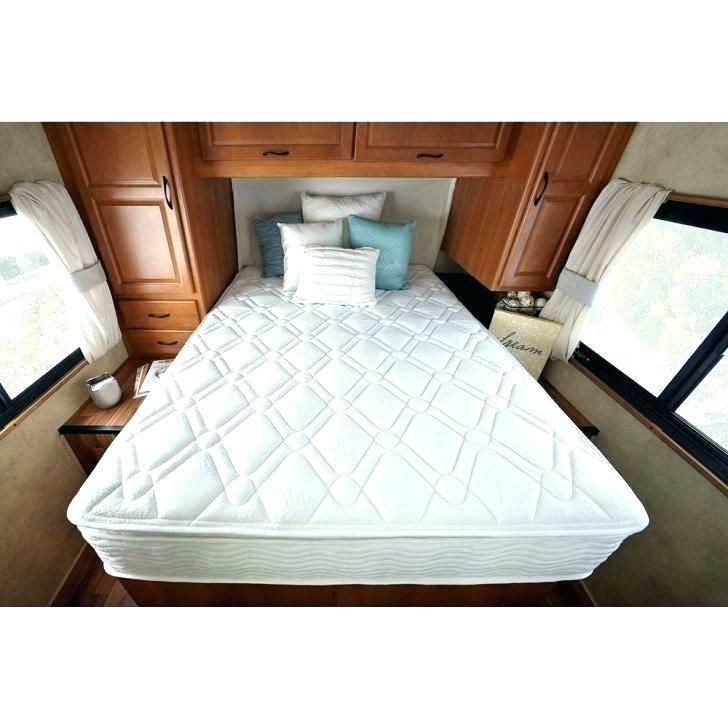 Our top pick is easily the eLuxurySupply RV Mattress Pad for king-sized beds. It is made from a comfortable and durable polyester-blend with a plush bamboo cover filled with 25 ounces of hypoallergenic alternative down cluster fiber. The fiberfill has the same feel as authentic goose and duck down without the uncomfortable feathers poking out or common allergenic components. There is also a double needle baffle box stitch that prevents the fill from shifting around as you sleep. This model is designed to work well with a variety of mattresses, including innerspring, latex, and memory foam. There are also options for other bed sizes, including Full/Three-Quarter, Short Queen, Queen, and Regular King beds. The RV King version measures 72 by 80 inches. If you prefer to support local brands, this manufacturer is entirely owned and operated by veterans. All of their products are made in the United States. We’re not the only ones who love this model. It has one of the highest ratings for mattress pads made for recreational vehicles. What sets this product apart is the attention to detail. Every aspect of its design is there to ensure ultimate comfort. The soft and cushiony Revoloft fiberfill offers a more humane and hypoallergenic alternative to authentic down while the bamboo cover creates a soft and easy-to-clean surface. If you’re in search of a quality option that provides support and works well on a bunk bed, this is a great model. It is designed specifically to fit in RVs and campers with a short queen mattress size measuring 60 by 75 inches. It can fit over mattresses 10 inches thick or less. The mattress topper itself is nearly an inch thick, providing cushiony support. The outside is made from a soft white 100% cotton fabric and the inside is stuffed with 100% polyester fiberfill. There is thin elastic sewn in around the edge to easily secure it to the mattress. This product can be washed in a normal wash cycle in a washing machine, but it is best to let it hang dry. It will be fine in the dryer as well, just make sure to use the tumble dry low setting and remove it as soon as it’s done. Like our first product, it is made entirely in the United States. This model is ideal for RV bunk mattresses that need a little extra support. Designed specifically for campers and RVs, the short queen size will be the perfect fit for most bunk beds. With a cotton outside stuffed with polyester fiberfill, it is soft and comfortable. It does not provide as much cushion as some other models, but still provides the extra support most bunk mattresses lack on their own. High quality with a low price tag, this model is perfect if you want something reliable and comfortable that won’t break the bank. It is 2.5 inches thick and filled with gel infused memory foam that will mold to accommodate your sleeping preferences and provide pressure-relieving support. This option is ideal for those that have trouble sleeping because of pain or pressure points. On top of that, the memory foam improves both the comfort and temperature of the mattress. Its ventilated design creates a cooling effect by increasing the air flow and preventing body heat from becoming trapped. The Short Queen is the perfect size for most RV mattresses, but there are also five other options available: Twin, Twin XL, Full, Queen, and King. The Short Queen is one of the more affordable options. It measures 40 by 18.1 inches. In addition, this model is certified by the CertiPUR-US for its superior performance, emissions, and environmental conduct. 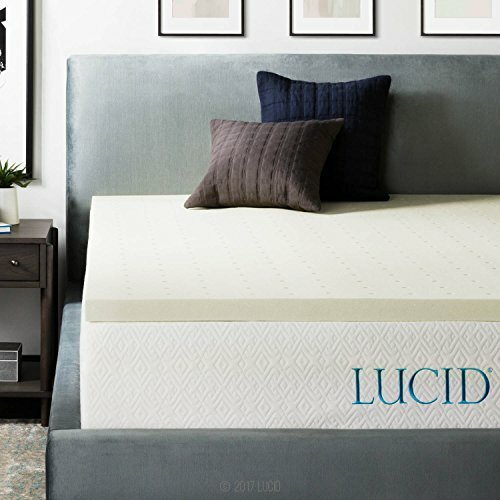 This affordable model has a unique design that is extra supportive and comfortable, especially if you have pressure points that prevent a peaceful night’s sleep. It has six different sizes so you can choose the exact fit for your mattress. The topper cover is not included when you purchase the mat itself, but it is also available for a low price. This model is the perfect fit for a RV queen mattress. Cozy and sleek with extra safety features, it will easily enhance the stiff mattress that come on most RV beds. It is 60 inches wide, 80 inches long, and 1.5 inches thick. The exterior is made from a white, water-resistant bamboo material and is stuffed with Revoloft fill, a cushiony and hypoallergenic alternative to traditional down material. There is also a fitted skirt to keep it secured on the mattress and create a more cohesive look. When traveling in the confined space of an RV or camper, fire safety is especially important. 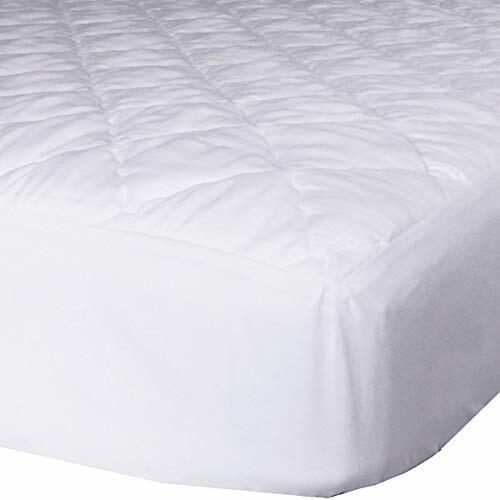 This mattress topper has been laboratory tested and certified safe by the Consumer Product Safety Commission based on its lack of flammable materials. 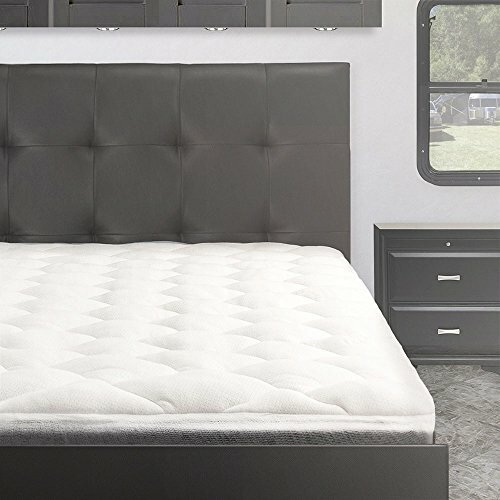 If you like this model and also want to get it for another mattress in your RV, there are short queen, king, RV king, and three-quarter sizes available. Overall, this model is high quality, reliable, and comfortable. The Revoloft filling provides a soft and cushiony feel without the poking or allergens of traditional down. It does not do well in washing machines, so it is necessary to carefully clean it by hand. Luckily, the bamboo exterior provides a sleek and water-resistant surface that is easy to wipe down. Another excellent product from veteran-owned eluxurySupply, this model is cozy, hypoallergenic, and made entirely in the United States. It measures 60 inches wide and 75 inches long, which will easily fit on top of a typical short queen-sized mattress. Its elastic skirt can be secured around mattresses that are up to 18 inches thick. The stain and water resistant cover is made from soft 123 thread count cotton secured with a double needle baffle box stitch that holds the fill in place. 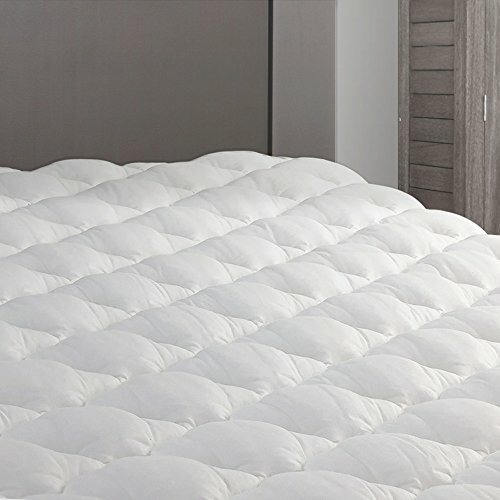 It has a diamond quilted design and each pad is stuffed with 25 ounces of cooling and hypoallergenic Revoloft fiberfill. It is easy to clean and is machine washable. Just make sure to wash it in a warm, gentle cycle and tumble dry it on a low setting to avoid causing any damage. There are also many other sizes available if you want to purchase this topper for a different sized mattress in your RV. They offer five size alternatives, including the RV Full/Three-Quarter, Queen, King, RV King, and Bunk. This model has a unique design perfect for a short queen bed with a hypoallergenic and cozy filling that utilizes advanced cooling technology for a comfortable and restful sleep experience. The elastic skirt can reach about 18 inches, which provides versatility but also means it can be too loose on thinner mattresses. This prevents it from securing the mattress in place and allows it to slide around on top. However, this is easy to remedy by tucking the skirt under the mattress or using bands to secure it. For RV king beds, this product fits like a dream. It is 74 inches wide, 78 inches long, and 4 inches thick. This topper consists of a 1.5-inch thick section of memory foam on top of 2.5 inches of high-density support form. 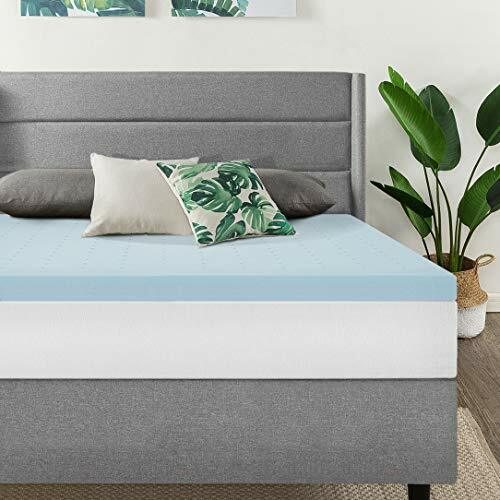 The top section is made from top-quality memory foam that has been certified by the CertiPUR-US for its exceptional durability, performance, and content. The foam is also infused with green tea extract, castor natural seed oil, and active charcoal, which all help absorb moisture and naturally prevent the growth of odor and bacteria. Like many of the other options on this list, Zinus designs toppers for a variety of bed sizes. They also offer this model in Twin, Full, Queen, and Short Queen sizes. For even further customization, there are also four available thickness levels. We recommend the 4-inch version for its comfort and cushiness, but if you prefer something a little thinner, it is also offered in smaller sizes ranging from 1.5 inches to 3 inches thick. This model will add extra support and comfort to any normal mattress. While its unique two-layer design may make it heavier and stiffer than some other models, it also makes it more durable and long-lasting. CertiPUR-US certified and infused with natural ingredients to prevent the buildup of mold and bacteria, it is also a very safe option. If you do encounter any problems down the line, Zinus offers a generous five-year warranty to ensure you can continue using this topper for years to come. Memory foam is hard to beat when it comes to coziness and pressure relief. Of all the options out there made from this innovative and comfortable material, this is one of the best. It features 2-inches of LUCID memory foam that is ventilated to improve air flow and keep it cool. It also utilizes open cell technology that forms to your shape while you sleep but prevents lasting body impressions. The foam has been tested and certified by CertiPUR-US for its excellent content, physical performance, indoor emissions, and environmental stewardship. This model is sized to fit perfectly with RV/Short Queen beds. The RV/Short Queen size measures 60 inches by 75 inches. If you want to use it on a different bed, they make this model in a wide variety of sizes, including Twin, Twin XL, Full, Full XL, Queen, King, and California King. There may be a chemical smell when the product first arrives, which is normal for memory foam products, but it will disappear if left in a well-ventilated room for about 48 hours. This model is made from CertiPUR-US certified memory foam that provides comfortable support and pressure relief. It is two inches thick, which is the perfect size to create extra cushioning. With memory foam mattress toppers thicker than that, you sink into them and they can quickly become uncomfortable and too warm. This model offers the ideal amount of support and cushion that will relieve pressure points. There is a wide range of materials used for mattress toppers. There are options made from wool, latex, and featherbed, but they are typically not as comfortable. Models made from cotton, polyester-blend, or memory foam tend to be the most comfortable and supportive. Cotton and polyester-blend toppers are breathable and easy to wash. They tend to be the most affordable, but generally wear out faster than memory foam models. 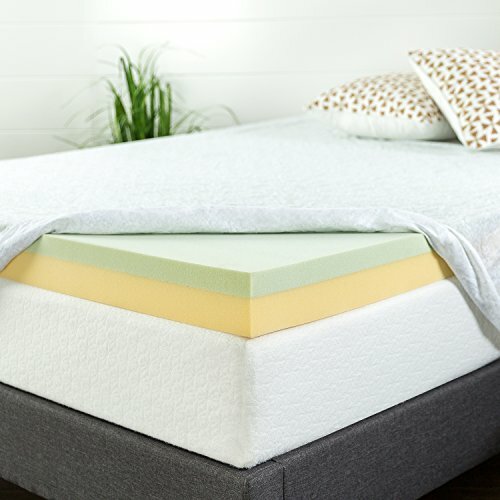 Memory foam provides relief for pressure points and forms to your body while you sleep. It is very soft and cushiony while still providing substantial support. Look for models that have some kind of cooling mechanisms, like gels, that help keep it at an even temperature as some memory foam products can become quite warm during the night. The first and most basic aspect to consider is the size. 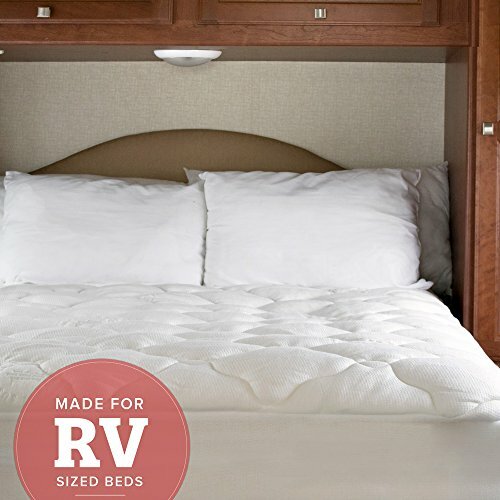 RV beds are often shorter than standard beds. Luckily, there are many companies that design mattress toppers specifically for RV beds with sizes like Short Queen and RV King. If you want something that is easier to clean, a cotton or polyester-blend is probably the way to go. Memory foam is more difficult to clean, but it provides form-fitting support and is especially helpful for those with painful pressure points. If you invest in a model that is stuffed, it is also best to avoid traditional down filling, as it can have pokey feathers and is a common allergen. Hypoallergenic alternatives such as Revoloft fiberfill and polyester fiberfill are much better options. It is important to understand your own sleeping preferences so you can find a model that supports your needs. For example, if you have painful pressure points that keep you up, memory foam can help relieve that pressure. Some people like a firmer surface while others like to have a very cushiony topper they can sink into while they sleep. Putting memory foam in a machine will destroy it, so it is necessary to always clean it by hand. For the best results, vacuum both sides every one to two weeks. To start this process, take the mattress topper from the bed and move it to a ventilated room. Place it on a tarp or some other kind of floor covering, then check it for moisture, stains, and smells. Start by vacuuming it to clean the surface. If you have a water-based vacuum, that is the best kind to use. If you didn’t notice any stains or bad smells, mix some gentle hand-washing detergent with warm water and put it into a spray bottle. Be careful not to use too much and soak the foam. Just cover it with a light mist and that should be enough to clean it. To clean a stain, scrub the stain with a mix of water and baking soda until it disappears or fades. Leave it to soak for half an hour, then use a damp cloth to remove the water and baking soda solution. If there is still water, blot it with a dry cloth. For harsher stains caused by things like blood or pet accidents, you will need to use a stronger enzyme cleaner. Hydrogen peroxide will damage memory foam and should never be used to clean it. To remove a bad odor, repeat the vacuuming and spray-cleaning steps a few more times and leave the topper our in the sun to dry. If that doesn’t work, try sprinkling a light layer of baking soda across the top. Let it air out overnight (or for a minimum of eight hours), then vacuum it again to remove the baking soda. Investing in a mattress topper is the quickest and easiest way to vastly improve your sleep while you travel. A quality model will provide the extra support and comfort you need for a more restful sleep. Still have questions? Scroll down to read the answers to our frequently asked questions on this subject. Will a Mattress Topper Help a Sagging Mattress? If your mattress is beginning to sag, it is in your best interest to invest in an entirely new mattress than to try and fix it with a topper. It will only be able to mask the issue temporarily. Toppers are great if you want a smoother surface over a bumpy or hard mattress, but for bigger issues it is best to buy a new mattress. What is the Difference Between a Mattress Topper and a Mattress Pad? Mattress toppers and pads are similar but are designed for different purposes. A mattress topper is a removable supplement that is put on top of a mattress to enhance its comfort and/or support. They are typically more expensive than pads. A mattress pad is a thin padding that attaches to the mattress like a sheet to either protect or improve it. How Thick of a Mattress Topper Do I Need? The ideal thickness will depend on your own sleeping preferences and needs. The standard model is about 1.5 – 2 inches thick, which will work for most people. It is the perfect balance between being too thin to offer much comfort and being too thick to provide adequate support. It will also vary by material. For products made from stiffer material, the thickness will not make as big of a difference. For softer materials, such as memory foam, the thickness of the product will have a significant impact on the amount of support it provides. Do You Put Mattress Topper Under a Mattress Pad? In most cases, using both is redundant and unnecessary. However, if you have a topper that isn’t water resistant or you are concerned about protecting the original mattress underneath, putting a pad under the topper can be an easy way to add some extra protection.